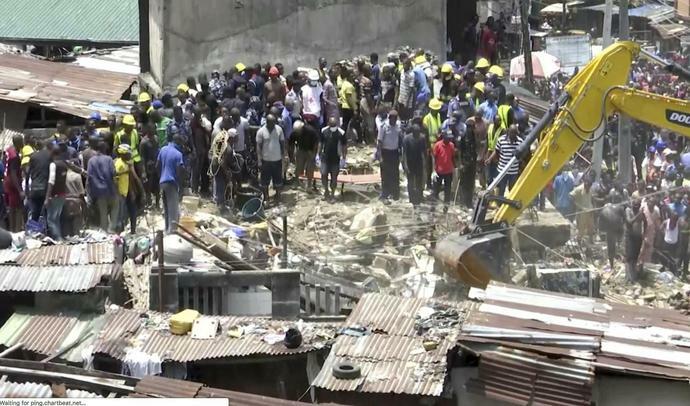 LAGOS, Nigeria (AP) -- A three-story building collapsed in Nigeria on Wednesday with scores of school children thought to be inside, setting off frantic rescue efforts in the country's crowded commercial capital. An emergency management official said more than 40 people had been found but it was not yet clear how many died. Associated Press video showed rescuers carrying several dust-covered, stunned-looking children from the rubble, to cheers from hundreds of people who rushed to the scene. But the crowd quieted as others were pulled out and slung over people's shoulders, unmoving. The children were hurried through the crowd to ambulances. One man pressed his hands to a passing survivor's head in blessing. Rescue efforts unfolded in the densely populated neighborhood in Lagos, Nigeria's commercial capital and a city of some 20 million people. More equipment was brought in as nightfall approached. As many as 100 children had been in the primary school on the building's top floor, some witnesses said. More than 40 people had been found "but for now I am not in a position to give the number of dead," Shina Tiamiyu, general manager of the Lagos State Emergency Management Agency, told The Associated Press. It was not immediately clear why the building collapsed. Such disasters are all too common in Nigeria, where new construction often goes up without regulatory oversight and floors are added to already unstable buildings. Lagos state Gov. Akinwunmi Ambode said buildings in the neighborhood, Ita Faji, should have undergone integrity tests but landlords resisted. Hundreds of people stood in narrow streets and on rooftops of rusted, corrugated metal, watching rescue efforts. A yellow excavator scooped at the ruins of rebar and dust. Later it nosed at concrete slabs. With emotions high, a number of shirtless men jumped in to offer assistance, hacksaws and mallets in hand. Some were barefoot. Some were bare-handed. One held a water bottle in his teeth. The collapse came as President Muhammadu Buhari, newly elected to a second term, tries to improve groaning, inefficient infrastructure in Africa's most populous nation. "Nigeria's infrastructure is generally less than half the size than in the average sub-Saharan Africa country and only a fraction of that in emerging market economies," the International Monetary Fund has noted. "The perceived quality of the infrastructure is low." There was no immediate comment from Buhari's office. Instead, as the rescue work continued, the president's personal assistant posted on Twitter a photo of a gleaming new terminal at the airport in the capital, Abuja. This version corrects that more than 40 people have been found but dead could be among them.